As I’m typing this, my trusty weather app tells me that it’s currently 8°F and feels like -10°F. In other words—it’s FREEZING here! I’ve not poked my nose out since coming home from work last night, and Avi’s had a cold all week, so we’ve decided to keep him at home until this frigid weather passes. Aside from running after a toddler, my thoughts generally turn to what to eat while being a shut-in. I could very well eat spaghetti carbonara through the long weekend and be happy doing so, but sadly, we’ve run out of pancetta, and had to make do with merguez meatballs and salad. In the interest of time, and the fact that I’m exhausted, I’ll keep this short. 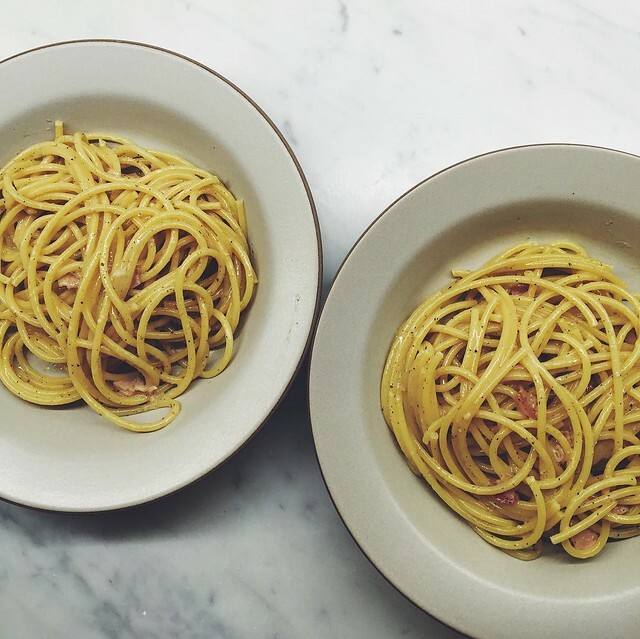 Many of you have asked for my spaghetti carbonara recipe and here it is. I don’t claim any originality to it since it’s one of the most popular pasta dishes in the Roman canon. I suspect there are as many variations on this dish as there are cooks, each with strong convictions on how this should be done. My method/recipe are a derivation of time, trial and error, and figuring out what tasted best to me. I started with a recipe from The Silver Spoon, which uses butter to cook the pancetta (which I prefer to oil). Through the years, I kept tweaking the recipe, namely in attempts to create a lush, luxurious sauce. In doing so, I added two yolks to the already existing two eggs; I made a slurry from the eggs, yolks, and cheese, and mixed it into the pasta off heat. And I dare say that this produces really show-stopping results. Keep in mind that with this—as well as many other pasta dishes—everything happens fast, fast, fast. So have all your things prepped and ready to go. And with that, I’m off to watch the Republican debate—an enviable Saturday night, don’t you think? In a medium bowl, combine the eggs, egg yolks, Parmigiano-Reggiano and Pecorino Romano and whisk until uniform. Generously season with pepper and set aside. In a large pan set over medium heat, melt the butter, add the pancetta, and cook until the fat renders and pancetta is light brown. Bring a large pot of water to a boil over high heat. Add enough salt so the water tastes like sea water. Add the pasta and cook until 2 minutes shy of al dente. Drain, reserving 1 cup of the cooking water, and add the pasta to the pan with pancetta. Add a splash of water, and toss the pasta with pancetta for 1 minute until the sauce has emulsified. Remove the pan from the heat, and whisk in the egg-cheese mixture, tossing quickly so the egg doesn’t curdle. Divide the pasta across the warmed bowls and serve immediately. Had not received any blog mail from you. I was wondering what was up. Miss your weekly blogs. I never eat spaghetti carbonara. Camila always eat after study music. Chef-Man is also proud to help provide vegan and vegetarian foods to over 1,000 different companies, and that number is consistently on the rise. We can help offer single-serve dishes for those who want a meal that is ready to heat and serve, or we can provide bulk containers for larger company cafeterias. Let us be your source of vegan and vegetarian gourmet meat alternatives now, and see the difference Chef-Man makes! Spaghetti Carbonara is easy to make Tasty Recipe. Everyone loves Spaghetti with sauce so do I.